A rainy, cool weekend. Hope you all had a nice Mother’s Day. Wish it would warm up and stay. It rained quite a lot, but the ground is still pretty dry. The bear is still around; was on Main Street, still taking garbage from cans and strewing it around the yard. Reminder to Lopez kids to remember to meet at the Post Office around 9:30 a.m. on Memorial Day to march in the parade. Any Lopez kids that weren’t contacted, feel free to join in. Memorial Day parade will be on Monday, the 30th. 10 a.m. in the Park. Congratulations to Kassidy Brown for achieving Honor Roll and to Kyler and Paige Burke, Layton Shea, and Aaron Kinsey for Distinguished Honor Roll. Keep up the good work. Joe Fanning, Landenberg, and a couple of friends, spent the weekend at his home on Church Street. They went to a horseshoe tournament in Benton on Saturday. Rev Mother Christophora and Mother Paula, Orthodox Monastery, Ellwood City, enjoyed a few days relaxation at St. Nicholas House on Church Street. Next Civic meeting will be Tuesday, the 17th, 6 p.m. at the Township Building. If anyone is interested, we’re still taking donations for up-keep and maintenance of Cold Spring. Send to Lopez Civic Assoc., P.O. Box 100, Lopez, PA 18628 and mark the enveloped “Cold Spring”. Bob, Jr. and Tyler McGuire, spent Mother’s Day with Bob, JoAnn and Brian McGuire and had a fun time while they were here. I know it’s early, but mark your calendar for the annual Lopez flea market. This year it will be held on Saturday, August 20th, 9 a.m. to 3 p.m. Check your calendar, attic, or garage to see if there are things you may no longer want or need. For more information, call me at the number below. Happy Birthday wishes to Cory McDonald, 15th; Marian Hubiak, 19th; and Susan Aharonian, 24th. Hope you all have a nice day. Happy Anniversary to Tim and Bobbi Jo Brown as they celebrate on the 21st. Have a good day. Adel Bradshaw, West Chester, is spending a few days at her home on Church Street. The humming birds are back. They usually come around Mother’s Day and did again this year. Nice to see the busy little birds again. Guess that’s the news for now. Enjoy your week, even though I heard it’s to be pretty rainy again. It is to be warmer for most of the week, so get out and about when you can. 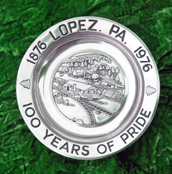 Have news call me at 570-928-9238; mail me; see me; or e-mail me at news@lopezpa.com I’ll get it in for you. Thanks for reading and I’ll be here next time.